I'm an nvALT refugee very glad to have found The Archive. I am a big fan of having certain applications always available without command-tab, mainly my note-taking and GTD apps. One of the most handy features of nvAlt was the eponymous Bring-to-Front Hotkey, which would show and hide nvALT regardless of the frontmost application in MacOS. I'm not sure whether this is a feature request or a misguided support attempt. Either way, if anyone has a method to accomplish either through 3rd party software or a missed (or not yet existing) feature in The Archive, I would greatly appreciate it. I use Alfred. I have a keyboard command designated which makes The Archive launch. When it is in the background, the same command brings it to the front. Thanks! I do too, and I did the same thing. 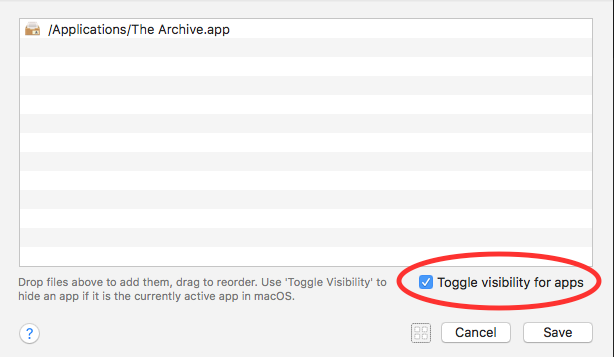 The only downside—and I am admit, this is very nitpicky—is that it doesn't toggle show/hide. My process was to be working in one application, have a thought or copy some text, toggle show nvALT, start or edit a note, write or paste, then toggle hide and be right back where I was in a very short amount of time. I'll flit back and forth like this several times with minimal effort. That's not nitpicky at all! I've set up macros like this one for the 12 apps that I most often use. Of course I am not contorting my fingers by hitting all four modifier keys by hand -- I have remapped CapsLock to "⌃⌥⇧⌘" using Karabiner-Elements. Since no programmer in their right mind would create shortcuts using all four modifier keys, shortcuts involving those four modifier keys are guaranteed to be available system-wide. Thank you Basil. That is going to be useful. I have implemented a Hotkey launch using Alfred Workflow. Within the Workflow setup there is a tick box (Toggle App). If you select this, then the same hotkey will hide the app - this should give the same toggle behaviour as we used to have in nvALT. Thanks @jgro and @Basil, this is such a great forum! Sorry everyone, I was away and missed all the fun! Thanks @Basil and @macosxguru especially for your feedback, and @nickmilo22 for the hyperkey-binding idea. @monions -- I could not locate that tick box in Alfred, can you send a screenshot? And what version of Alfred are you using? @Vinho - glad you're enjoying. In the workflow, add the Actions > Launch Application/File. In that window you select the application to be opened and in the bottom right there is a tick box to toggle the app. I'm using Alfred v3.7. Thank you so much @monions ! I totally missed that!